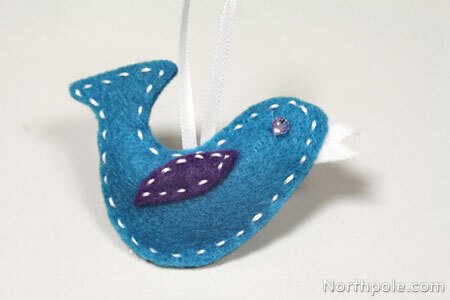 This cute, fluffy, little bird needs a cozy home on your Christmas tree! 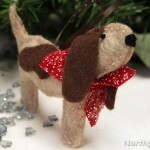 Make one (or several) with bright colors for a whimsical Christmas or natural colors for classic appeal. We love the look of hand-sewn stitches, so we’re partial to using thread in a contrasting color. 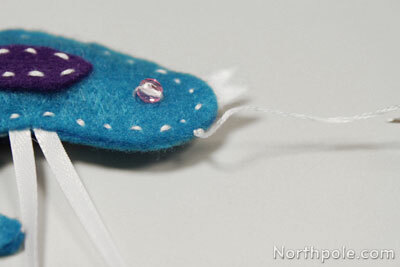 You can also use sequins, mini wiggly eyes, or small buttons for the bird’s eyes. Print out template and cut out pieces. 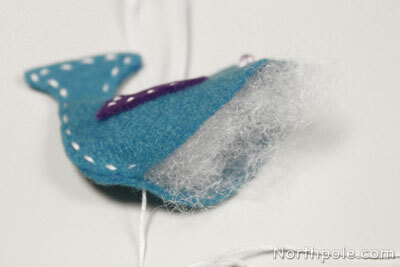 Choose felt color for the bird’s body and wings. Pin pattern pieces to felt. Cut out pieces. Remove pins and pattern; set aside. Place a wing onto each body piece and sew in place. Be sure that the two body pieces are mirror images of each other. 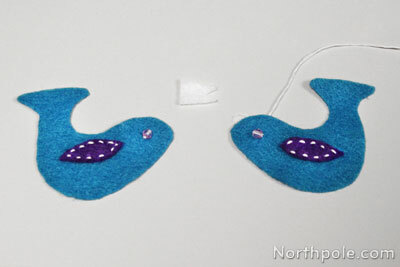 Sew a bead for the eye on each body piece. 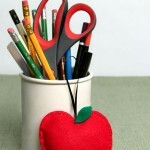 Cut a piece of ribbon that is 6" long. Now, stack body pieces together. Be sure that the wings are facing outward. Begin sewing around the body. 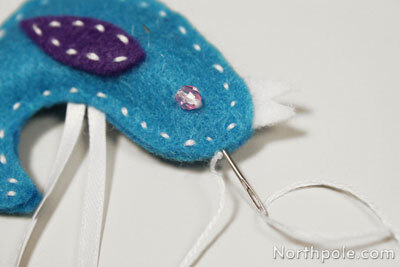 You can do a straight stitch or a blanket stitch. 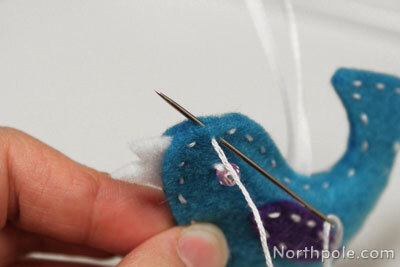 Start sewing at the top of the bird’s head, along the back, and around to its belly. Now pause for a moment to stuff the bird with Poly-fil®. 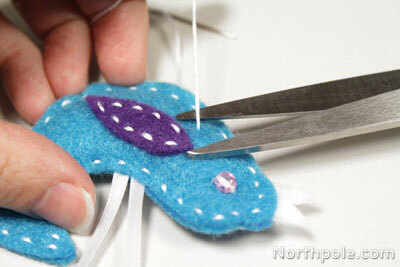 Once stuffed, continue sewing, adding a beak to the head. Once you reach your first stitches, sew a few extra stitches for security. 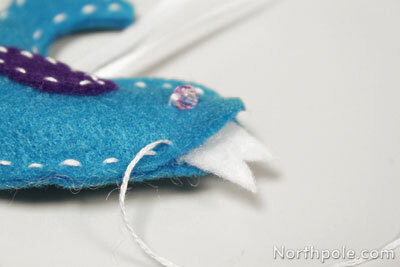 To tie off the thread and hide the knot, poke needle through one layer of felt, pulling it through the middle of felt layers. Double knot the thread, keeping the knot flush with the felt. 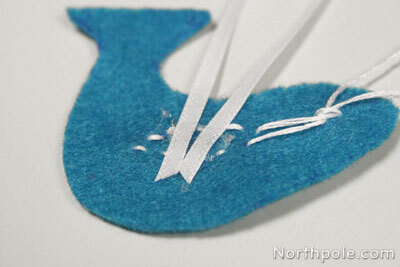 Poke the needle in between the layers of felt to hide the knot. Pull needle through belly of bird and cut thread. 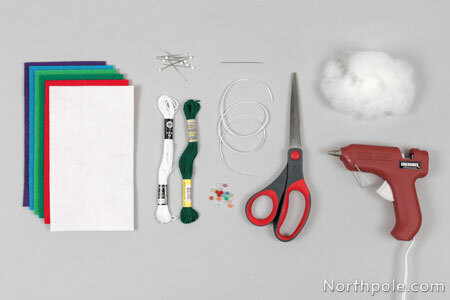 Use yarn to make dangly legs, and tie knots for feet. 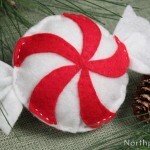 Put the ornament in a paper cone and give them away as Christmas gifts or party favors! 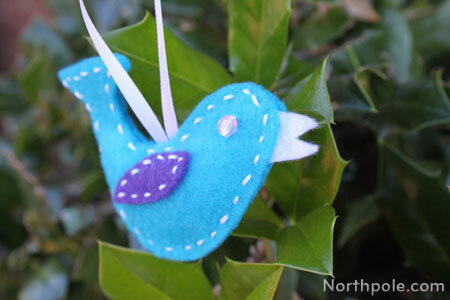 Decorate a gift with a bird or two instead of a traditional bow.